There may be a lot of companies in Chicago that claim to be commercial repair experts, but there’s only one that’s the real deal: Matthews Wall Anchor. With over 35 years of experience in the commercial and industrial repair business, we are confident that we can give you the best service, product, and results. We specialize in piling, shoring, and underpinning solutions to support and stabilize large structures. We will find the underlying cause of the damage and develop a solution that will keep your building stable and safe. Matthews Wall Anchor proudly uses the latest and best products from Earth Contact Products (ECP). ECP is the leader in foundation repair products including helical piers, soil nails, augercast piles, and steel piers. 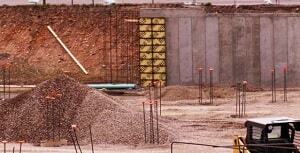 ECP products are designed to strengthen, support, and stabilize commercial foundation walls. For more information or to schedule a free inspection and estimate for your commercial property in Chicago, IL, contact us today. Our knowledgeable staff can answer any questions and assist you in achieving the best foundation repair service in the area. Call today, we look forward to hearing from you!